pictured above: what i finished today is the right hand frame of the bed, all of this will be covered with foam and dark grey fabric and will fit on the frame/legs that i completed months ago. 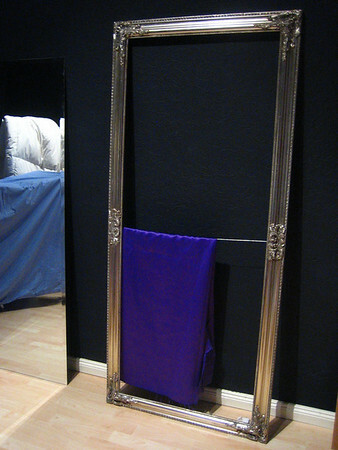 pictured below: the frame (that came with a mirror) that will be the frame of a purple tufted satin headboard mounted landscape-wise behind the bed. 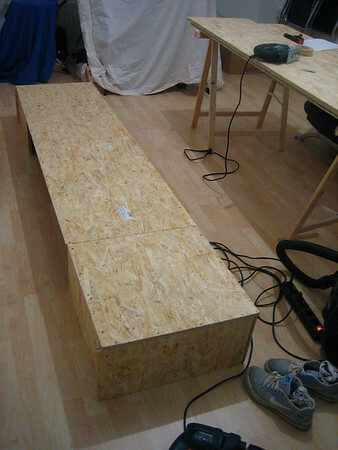 This entry was posted	on Sunday, January 7th, 2007 at 17:19	and is filed under projects. You can follow any responses to this entry through the RSS 2.0 feed. You can leave a response, or trackback from your own site. This is incredible! I’ll be linking to it later today! This is just mad impressive!!!! This bed is amazing, you did a wonderful job. I was curious, with all the open space under those boxes, did you leave a door or opening where you could possibly utilize that area as storage? I love having large areas to store stuff like to keep the rest of the house clear. Wonderful job, it looks great, I love the low lamps framing the bed. Very symmetrical. Hope to hear from you. Is it difficult to make this bed daily?